The Monteverde Stylus Ballpoint Tool Pen is the ultimate travelling workspace companion. 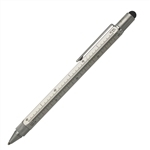 the Monteverde Stylus Ballpoint Tool Pen brings 9 tools in one premium quality writing instrument! With 9 useful tools secured in one six–barrel (sided) pen, this multi–functional tool pen is the ultimate travelling workspace companion. The Monteverde Stylus Ballpoint Tool Pen is a pretty unique ballpoint pen which Monteverde has come up with. It integrates multiple tools into one product. 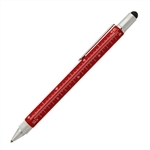 First off we have the bubble level on the pen which allows you to see if your surface is level or not. It also comes with a multi-scale ruler on the pen. Then we have a four inch ruler. We also have three different metric scales around the pen. It has a chrome clip here on the pen. The next tool on the pen is the stylus. It is a touch screen stylus which allows you to use the pen on any kind of a touch screen whether it is an iPad, an iPhone or a phone, e-readers, any kind of tablet or whatever touch screen you have. You can unscrew the stylus off the top. Underneath the stylus we have a screwdriver.That can also be reversed so you have a philips screwdriver on the other end. You can replace the stylus back on the top. On the other end of the pen is the ballpoint pen. It has a cap that unscrews from the pen. The heart of any pen - simple or fine - is the refill. It's what colors your thoughts and helps you deliver them in a smooth, continuous extension of the self. The Monteverde Stylus Ballpoint Tool Pen ships with the Monteverde refill and that it uses the standard D1 size refill but you must also say that it is compatible with the Schmidt 635 refills. The German 635 refill is an upgrade over the Montverde version. It uses Soft Roll™ ink technology – free flowing, low viscosity ink to provide a smooth writing experience. Available in Black, Blue, Red and Green ink. A great gift idea! This high quality, heavy weight multi-function Monteverde Stylus Ballpoint Tool Pen gadget pen comes with 9 different handy functions and is available in Black, silver, dark blue, bright yellow, orange and red, a wonderful gift with a sleek aesthetic, this pen is excellent for professionals or students, and is also favored by draftsmen, architects and trades people for its functionality and reliability– it comes with Monteverde's lifetime guarantee.